Good content can persuade readers to become customers. It can rally people behind a cause. It can convince others to take a chance on you. Whatever the goals and outcome, we are voracious consumers of content and there is no shortage of possibilities for that content to be consumed. The problem lies in finding the right platform to reach your target audience. Be it a blog on your website, newspapers, or social media sites like Twitter or Facebook, there are many platforms to deliver your content. Not all are created equally. For professionals looking to achieve strategic goals with their content, they need to use a platform that was built for professionals and is consumed by professionals. As a network of professionals with different backgrounds and expertise, LinkedIn, smartly, realized a blogging platform that allowed users to showcase their talents, thoughts, and expertise would be very valuable. They created a publishing tool that allowed professionals to create long-form blogging content. With a platform accessible to 230 Million members in all English-speaking countries, the potential for this tool to grow a network and accomplish strategic goals is amazing. Even better, global business leaders like Richard Branson, financial gurus like Suze Orman, and authors like Daniel Goleman have adopted the platform as an amazing place to engage new readers. Word is spreading about the quality of content on the platform. 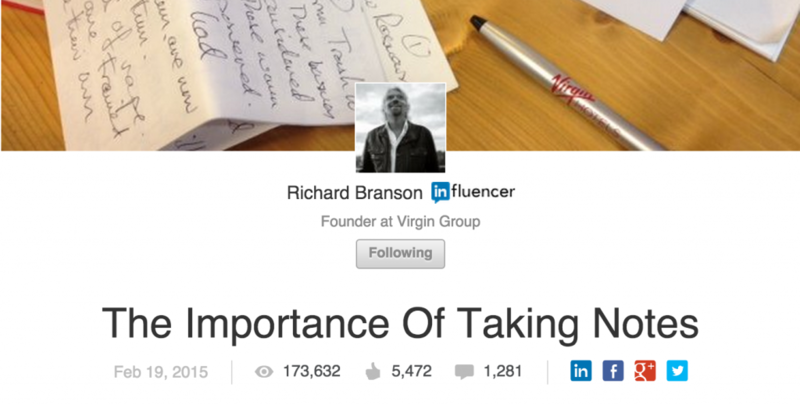 Take Richard Branson, Entrepreneur and Founder at Virgin Group. In a recent post, he had as of writing this 173,000 views. 5,400 gave it a thumbs up. 1,200 commented. The reach of just this post is unbelievable! The LinkedIn publishing platform has skyrocketed and become a platform that can transform professional careers. 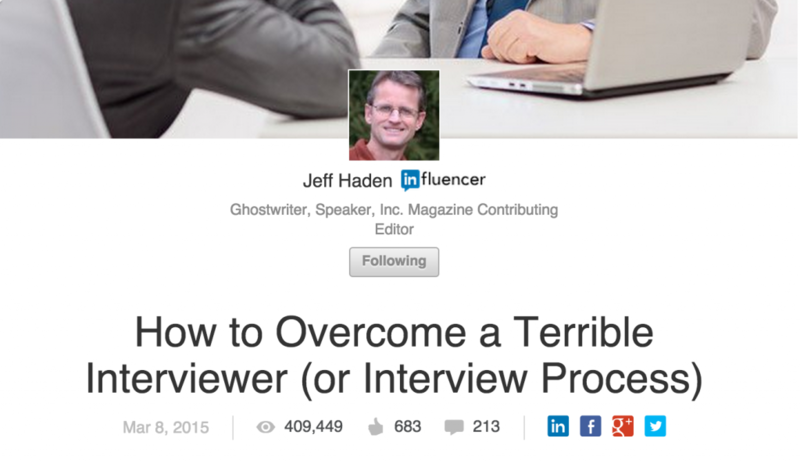 Jeff Haden, self-described Ghostwriter, Speaker, and Inc. Magazine contributing editor, has 460,000 followers. The above post reached over 400,000 people. The LinkedIn Publishing platform is a ripe platform for professionals with something to say to do just that. “I don’t have anything to say,” is probably the first thought that most people have when they think about why they aren’t using the platform. However, that’s not the right answer. You do have something to say. Everyone is an expert on something and has experiences that can help to inform professional communities. The problem is: you don’t have the time or the inclination to figure out how to say it. At the core of everything Vision Board Media does, it’s the ability to speak for others. We understand that it’s difficult to put your own thoughts and beliefs into clear, concise language. You’re too close to the source material to be objective, to approach language stylistically, and to structure your thoughts in a strategic way. Everything we do is a synthesis of our client’s thought leadership and marketing. We transform core beliefs into a language that causes a change from motivation to persuasion. We work closely with our Executive Content clients to get to the core of what you are trying to achieve in your career, what you need to say, and how best to say it. We brainstorm and work collaboratively to explore what you can say, evaluate the best way to say it, and help you put it on paper. With a sharp eye on branding, we present the post with the right eye-grabbing image, carefully constructing an evocative title, and put together a composition that encourages reading. We know what’s getting responses. Then, when it’s ready, we put it out in the world, using our wide social media reach (our founder, Donna Serdula, has have over 6,000 followers) we will get the word out about your post. We’ll teach you how to engage with readers, encourage comments, and reach out to people to help it’s reach. You won’t get Richard Branson numbers overnight but you will start to see amazing results, your strategies taking hold, and build a following. The content that we create for you can go beyond LinkedIn. This is content that can be put on your company’s blog, used in marketing material, sent to periodicals and newspapers for publication, and dispersed to even wider audiences. The content is yours lock, stock, and barrel. We are currently working on new avenues and partnerships to help our clients’ content make an even bigger impact. For us, this is an opportunity to spread our wings and try new things. Click here to tell us a little about what you want to talk about or call us at 215-839-0008. Let us help you discover what you need to say.